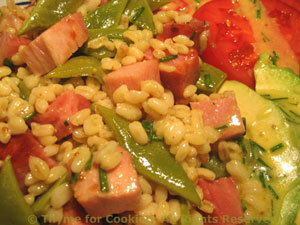 Barley Salad with Ham and Green Beans, Thyme for Cooking gourmet menus. Barley is a very versatile and healthy grain. It works as well as a base for a salad as pasta or rice. With only the barley requiring cooking this is a very easy summer salad. Use quick-cooking pearl barley, which takes about 15 minutes. Cook in chicken stock for added flavor. I used the flat, Italian beans in this but any green or yellow bean will work. Put barley and chicken stock in a small saucepan. Cover and simmer until tender, about 15 minutes for quick cooking barley. Top and tail beans. Cut into 1 1/2" (4cm) lengths. Bring a medium saucepan half full of water to a boil over medium-high heat. Remove, drain and refresh in cold water. Cut ham into bite-size pieces. Slice avocado and tomato. Snip chives. Make vinaigrette: Whisk all ingredients until well combined. Put barley into a large bowl. Add beans, ham, chives and half of the vinaigrette, Stir to combine. Divide and spoon onto 2 plates. Arrange half of the avocado and tomato on each plate, drizzle with a bit of vinaigrette and serve.